It can be pretty difficult to discern SO much as a parent—especially when it comes to mealtime. What should we feed our kids? How frequently should they eat—or, if you’re the parent of a toddler, HOW can I even get them to eat? A question not often asked is how to know when your baby is full, and this is a discussion worth having. Depending on the age of your baby, it’s important to keep in mind that breast milk or formula is still their main source of nutrition until their first birthdays, but introducing solids is a wonderful thing to do after your pediatrician or care team gives it the go-ahead: this will usually happen after their 6 month check-up. When it comes to feeding this little person, it’s vital that you can help them develop healthy and happy eating habits that include knowing when they’ve had enough to eat. Like with most other baby-related things, they are well-equipped to give their own little signs when something is up or if they have a need, and this extends to being full after a big meal as well! A baby who is still exclusively drinking breast milk or formula will start to get sleepy. His hands will become soft and open and his arms will relax. Often you can tell if your baby is full based on the chicken wing test! What’s that? If baby’s arm is bent, tensed, (looking like a chicken wing!) and stays that way as you try to move it, your baby is probably not full yet! Try waking him up or switching positions and offering the bottle or breast again. If baby’s arm is loose and limp and his hands are relaxed, you’ll be able to flop it around! Baby will be relaxed and sleepy and is probably full. As baby grows, it may be more difficult to tell when he or she is full. A baby of around 6 months of age who is full might lose interest in what’s on your spoon-plane inbound to their mouth, or may begin to look around or shift in hopes of moving on to the next activity. 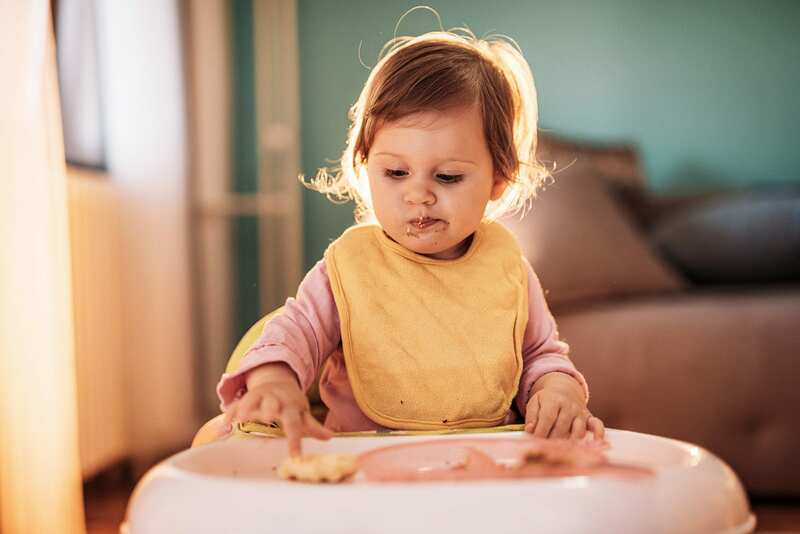 Older babies do this as well, but might be even more obvious in their attempts to stop eating—this is the age where mealtime can become messy if baby is refusing food by way of knocking the spoon out of your hand or swatting at it. A lot of parents have concerns that baby is simply getting bored with mealtime, and this can be the case as well. Rather than forcing the food on baby and making them finish while they’re irritable, try distracting them while still seated for a bit with a game of peek-a-boo or singing them a song or rhyme. Stimulating another part of their brain might allow you the time to sneak a bit more food in—but if they push it out or insist on not eating it, consider them to be saying “check, please!” and stop feeding. Babies are creatures of habit—I once heard routine for a baby is like a wristwatch by which they measure their day. If baby isn’t given enough time to eat on a normal day, they might speed-eat and consume more than they bargained for in hopes of filling up to get to the next activity, leading to tummy troubles later on. Take it slowly and teach them to savor their food, all while paying attention to cues that they’ve gotten full. What Happens if Baby Gets Too Full? Babies are mystifying creatures, but they are merely tiny, cuter versions of us: if baby overeats, expect to find them grumpy or feeling ill later on. They might also experience gas, indigestion, or other symptoms we might endure as well if they’ve eaten too much. As long as problems do not persist past an hour or two, baby is likely just digesting the goodness they took (too much of) in. How Do I Know They’ve Gotten Enough? Another issue parents deal with is wondering whether or not baby is getting adequate amounts of food. Baby’s under six months old can be weighed before and after meals to determine the amount of breast milk or formula they’ve taken in! This information, along with their weight gain and growth, should help you to determine if baby is getting enough to eat. As babies begin to eat food, it can get confusing, especially in that transition from primary calories coming from breast milk and formula to food around one year of age. Some signs that could present as “fullness” cues are symptomatic of other things as well, ranging from boredom to defiance. Getting to know your baby’s specific personality and preferences is key here—if baby has a favorite food offered after refusal of others and they still aren’t interested, it’s likely they really are full. Consider whether or not they’re drinking too many liquids past their 1st birthday mark as well, as this is a common issue with toddlers who drink their calories and don’t eat enough of them. Knowing when your baby is full can be a struggle, but like many other things in parenting, it will become less stupefying as time goes on. Continue to offer a variety (introducing new foods after 4-5 days with one food) of foods, a consistent schedule, and tune in to what your baby’s nonverbal cues might be telling you: the clean plate club is overrated, anyways.